It was 1969 when Lake Erie caught fire due to negligence and mishandling of pollutants from industrial plants that lined its shores. David Maisel was only eight years old when he watched the footage of the disaster on television. This early childhood memory was a key component in shaping the imagination behind the seven projects Maisel photographed from 1985-2007, compiled for the first time in Black Maps. Together the projects present a cohesive, larger body of work about the effects of rapid urbanization and the depletion of the earth's natural, non-renewable resources. An essay that provides deeper understanding of the individual projects, written by photography curators and critics, precedes each project. In the first two bodies of work, Maisel uses black & white photographs to explore the effects of mining and rapid sprawl in Utah, Arizona and New Mexico and documents a massive logging project in Maine. 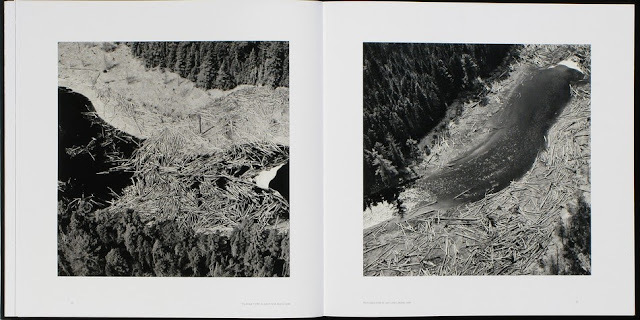 The aerial photographs provide a bird's eye view of the marred landscape, giving a sense of scale that is both compelling and frightening, and borrowing from the book's subtitle -- apocalyptic and sublime. Silvery shards of wood come to life in black & white, lining the shores of lakes and ponds in Maine. We marvel at the beauty of what is presented to us, but as soon as we recognize what we're looking at, dread quickly follows. 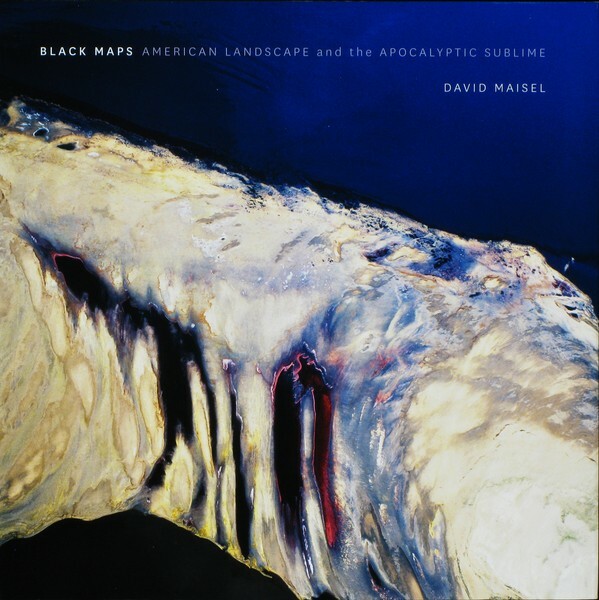 Black Maps by David Maisel. Published by Steidl. Something shifts in the third body of work, The Mining Project, when Maisel begins photographing in color. Are these oil paintings? Doctor's slides placed beneath a microscope? These exquisite colors surely cannot be found in nature and point to something far more sinister: large-scale human intervention. The rich colors draw us in while the depletion of natural resources (copper, silver and gold) makes us turn away. What does it mean for something to be beautiful and horrifying? Natasha Egan explores this dichotomy in her essay, Eliciting Anxiety in The Presence of the Sublime. She writes, "We see beauty in toxicity and witness the sublime in the seditious treatment of nature… Consequences of our fascination exist, of course, but they cast neither guilt nor absolution." Maisel photographed the Berkeley Pit in Butte, Montana thirty-four years after mining began in 1955. The mine remains inactive after rising energy costs forced its owners to suspend operations in 2000. However, the pit continues to fill with heavily acidic water, leaching arsenic, cadmium, zinc and sulfuric acid from the rock -- dangerous chemicals that contribute to the bizarre, psychedelic colors we find in Maisel's photographs. The Berkeley Pit presents a much larger problem in the wake of large-scale, systemized extraction of natural resources. Long after the mines are defunct, toxic chemicals continue to endanger nearby communities. The Lake Project explores Owens Lake just east of the Sierra Nevada mountain range in California. The lake suffered from large-scale irrigation in an effort to divert water to Los Angeles in the late 1800s. By 1928 it was bone dry, causing massive dust storms that halted growth in the Owens Valley. Eventually, water was diverted back into the lake, but the surrounding landscape never quite recovered. Oblivion documents the massive sprawl of Los Angeles in black & white -- from complex arcing freeways to gridded communities. For Terminal Mirage, Maisel switches back to color to photograph the Great Salt Lake and surrounding mining projects. The colors are so nauseating (yet beautiful) that they are perhaps the most difficult to absorb as natural landscapes. Finally, the book concludes with the American Mine project -- also in color. Maisel has clearly perfected his technique here, blending elements from his previous bodies of work in a stunning climax. Scale is the operative force in these almost unfathomable photographs, with which we come to grasp by scanning the frame and recognizing a tree, car, or building. We get the sense that he could continue making these photographs forever -- all over the world.